H. JAMES (Jim) WILSON leads Accenture’s Information Technology and Business Research. Wilson has dedicated his career to research and innovation, having led programs at Babson Executive and Enterprise Education, Bain & Company, and several business think tanks. Wilson is a coauthor of The New Entrepreneurial Leader which pioneered a new approach—entrepreneurial leadership—developed by him and a team of experts at Babson College. 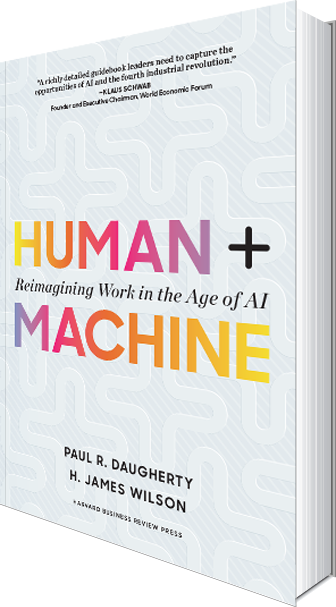 He is also coauthor of Human + Machine which has been praised by Satya Nadella (CEO of Microsoft), Arianna Huffington (CEO of Thrive Global), Marc Benioff (Chairman and CEO of Salesforce), Doug McMillon (President and CEO of Walmart), and more. A long-time contributor to Harvard Business Review, MIT Sloan Management Review, and The Wall Street Journal, Wilson has written extensively on how smart machines can enhance worker performance—including some of the first HBR articles on personal analytics, social IT, wearables, and natural user interfaces. Wilson has worked with governments, policy makers, and university and business leaders in applying these technologies to empower and augment people. An avid triathlete, Wilson enjoys teaching friends and family his geeky techniques for boosting health and fitness using bike power meters, heart rate monitors, and GPS distance and pace trackers. He lives in San Francisco with his wife and two children. Join Jim on Twitter today.